So, it was my birthday Saturday. 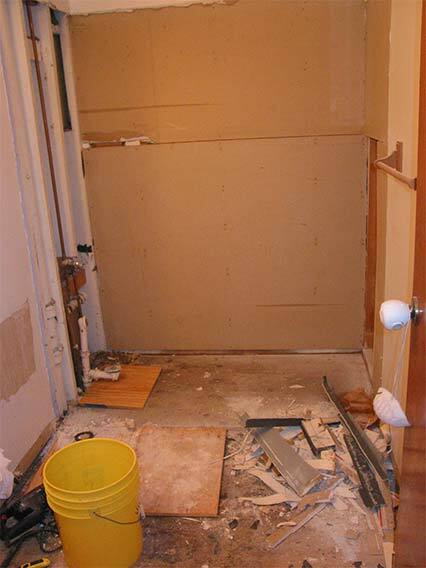 For my birthday, it was decided that I would work on taking out the toilet in our hall bathroom knowing that I would be ripping up the linoleum and some subflooring because it has been soft around the toilet from a water leak. 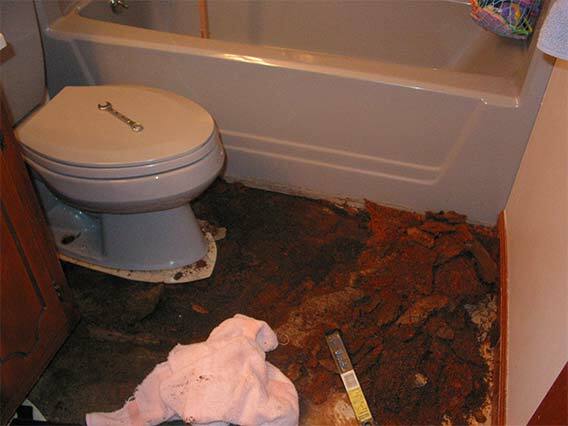 Friday night, Anita and I went ahead and started working on the bathroom a little to mostly see if I could get the toilet removed. I just wanted to have that part out of the way so that it would be one less thing to do on Saturday morning. In the picture at right you will find the state of the bathroom on Friday night. We started in on the toilet, and I at least got the tank off. However, the nuts connecting it to the floor were so rusted together that they turned in one solid piece. There was no way I was getting them off of there. While I was in the other room looking up something, Anita decided to go ahead and tear up the linoleum around the toilet and start ripping up the soggy wood subflooring which looked like an inch and a half of wet sawdust. Well, Saturday morning came not quite so bright and early as we had hoped because Conner was up during the night throwing up. This of course made for a very fun night and started the morning off roughly. After much groaning and creaking of [old] bones, I managed to get up and out to Lowe's. After I returned home, I decided to go ahead and take the toilet out. 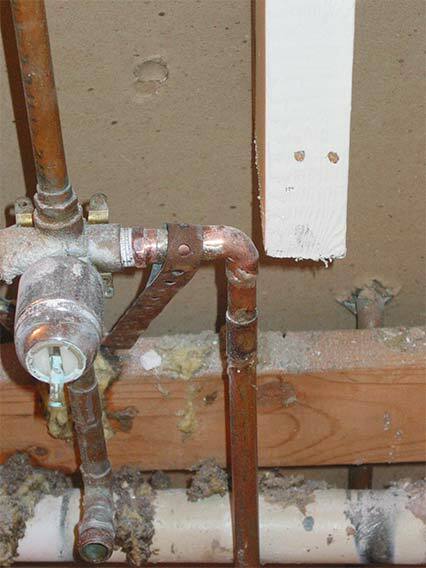 The easiest possible way to do that was going to just be to break the porcelain around the bolts. Yup, hammertime! That worked splendidly well. 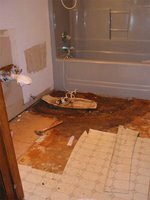 Next, it was easily noticable that the water damage under the floor had reached down to the actual floorboards and had spread out enough that we needed to replace the wood under the vanity. That means, of course, out came the vanity. 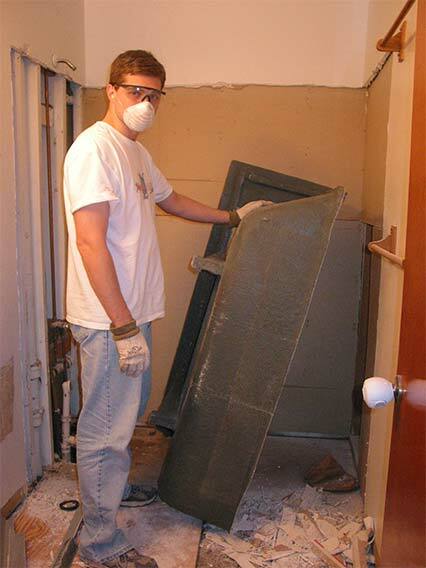 The day contiuned with me ripping out all the linoleum and subflooring in the room. I was left with just the floorboards over the studs .....and the tub. At this point, Anita and I needed to make a decision. We weren't sure if the floor had rotted under the tub or not. 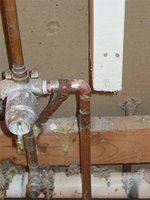 If it had, we really didn't want to leave the rotten floorboards under the tub and just replace a section of them. However, it would be considerably less trouble to just replace part of the boards and then go from there. We debated for awhile and then just decided to go ahead and take out the tub. I spent the remainder of my day trying to figure out how to get the tub out. I started with the reciprocating saw and cut a piece out of it. It sure wasn't goin very fast though and I figured it probably was that I didn't have the right blade or maybe I needed a new blade for the saw. I decided to go to Lowe's and pick up some new blades and then ask them a few questions. The guy at Lowe's showed me blades I could use and then told me how to cut the tub so that it would be easy to take out. I came home and those new blades sure worked well. Well enough that at 8:30, I managed to cut through a water line. That's right, a WATER LINE!!!! I had to frantically call my neighbor, and get the tool to cut the water off out front. Then, with his help we diagnosed the situation and I ran to Lowe's (since they close at 9) to quickly pick up everything needed to fix it. The picture seen here here is of the new corner piece my neighbor rebuilt for me from 9:30-10:30. Did I mention before that it was my birthday Saturday. Yah, happy birthday to me. This is me taking out a toilet. Sometime around 8-8:30 pm last night I had the bathtub completely removed from the room and the entirety of my damage could finally be seen. I guess we're getting a new bathroom. Anyone want to pay for it? Yah, me neither. It's times like these when you look and appreciate a professional doing a job for you. It's times like these when you ask yourself, "Why did I start this again? It's times like this when you want to move. On the bright side, the floor under my tub wasn't really rotten and I could have kept it. Did I mention that it was birthday on Saturday? 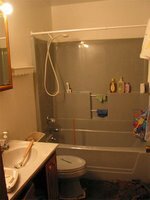 After a long weekend, and much work left in front of us, here is the bathroom we were left with at the end of the night on Sunday. At least it looks more spacious, right? Anita has said she wanted a bigger bathroom after all. I wonder if she was meaning that she wanted a sink, toilet, and tub as well?